This is one of those great home-school moments. . . find Asia Minor on a map. You probably won’t find it. It is the historic geographical term for the peninsula, forming part of the empire of Turkey, on the extreme west of the continent of Asia bounded on the N. by the Black Sea, on the W. by the Aegean, and on the S. by the Mediterranean, and at its N.W. extremity only parted from Europe by the narrow straits of the Bosporus and Dardanelles. Even when this map was published in the 1911 Encyclopedia, the authors admitted that the tern Asia Minor was generally no longer used. Looking at the map, you’ll also see this area is labeled Anatolia. It was the tern used by the natives for the western part of the peninsula. What is labeled as Asia Minor on this map is now lands that are part of the countries Turkey and Armenia. It is a bit of a bridge between Asia and Europe and has seen many battles fought on its soil. The lack of a navigable river and being the host of many hostile armies, the area was primarily settled by tribes. Again, I’ll leave the geo-political research for home-schoolers and those interested in further study of the area. For our purposes, this is just a very quick overview to compliment this vintage Asia Minor map. 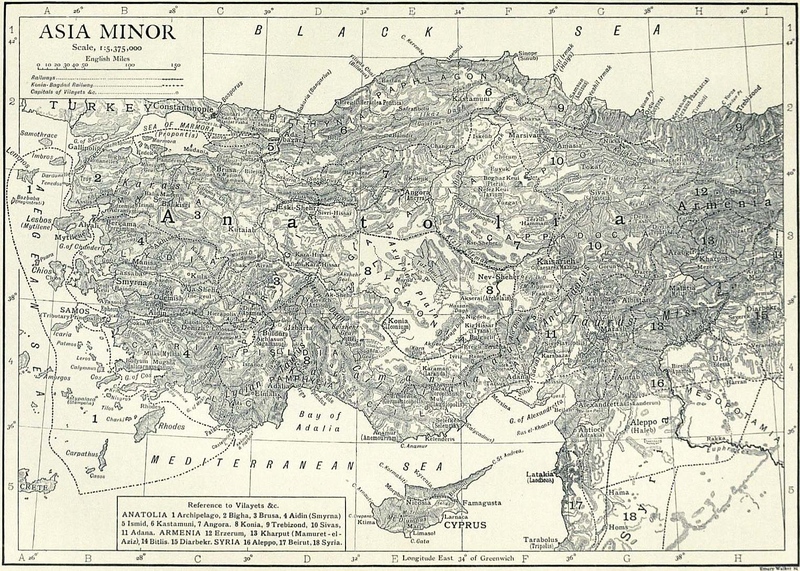 Click on the Asia Minor map shown above to see and download the full-sized version of this vintage map.